Cercis canadensis ‘Covey’ ( Lavender Twist) is the weeping red bud, increasingly popular in Australia and readily available for sale. 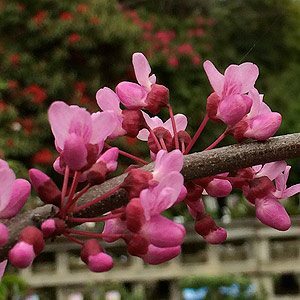 An excellent small tree with brilliant spring flowers and graceful weeping foliage Cerci canadensis Covey begins its show in spring when the bare stems are covered with deep pink flowers. ‘Covey’ will reach around 3m in height depending on the way that is grown. The flowers are followed by heart shaped green leaves that in autumn provide good colour. A specimen tree in the lawn. A feature in the garden border. Trained for a Japanese style garden. Cercis canadensis ‘Covey’ can also be grown in a container. The thing that makes ‘Covey’ different is the lack of strong leader, this gives it its rounded weeping shape, plants that are not staked will be shorter growing. Full sun to part shade, although protection from afternoon sun is required in warmer climates including most areas of Australia. Deep shade is a problem that needs to be avoided as Cercis canadensis ‘Covey’ like all of the redbuds will not flower well, or at all without adequate sun. It is important to select the right position when first planting as this is a tree that does not take well to being transplanted. Digging or cultivating around the roots should also be avoided. Depending on the effect you wish to create, young trees can benefit from being staked to help develop some height, making sure that the stake does not damage t he bark. Trees can also be trained to grow on an angle, similar to some of the Japanese styles. Good drainage is essential as is a humus rich moisture retentive soil. Mulch well around the tree each spring to help maintain a cool root run. New trees can be watered in with a liquid seaweed fertilizer.